Click color squares for more info. Mountainous terrain, most geologically diverse. Heavily Forested, Most favourable climate for plant growth. Longest growing season, Highest temperatures and humidity. Greatest temperature variations due to changes in elevation. Eastern Chipmunk, Pine Marten, American Toad. dry in summer, lightest winds. Heavily forested with black spruce/kalmia (goowitty). Black Spruce, white birch & trembling aspen. warmest coastal area in summer. Black Spruce, balsam fir & white birch, less abundant white spruce & aspen. Common Redpoll, Bald Eagle, Osprey. Divided east from west by the Longe Range Mountains. Flat lowlands to the west, foothills to the east. Coolest climate, lowest precipitation/ low evapotranspiration. Balsam fir, black spruce at high elevations. Past the northern limit for white birch & pine, red maple & trembling aspen. Northern Harrier, American Bittern & Short-eared Owl in wetlands. Low elevation, irregular low hills with steep sides. Scattered with small ponds and bogs. high precipitation but little snowcover in winter. Yellow Birch with spruce & fir. Goshawk, American Bittern & Sharp Shinned Hawk. Low, undulating, open country. Barren due to frequent fires. high precipitation with no permanent snowcover in coastal areas. Some Balsam Fir & Yellow Birch in valleys. Wintering grounds for large herds of caribou, 21 major seabird colonies offshore. Rough Legged Hawk, Short-eared Owl, Sharp Shinned hawk, Belted Kingfisher. Flat to rolling, open country. high precipitation with variable snowcover. Treeless coastal barren, fir tuckamoor. Includes the largest seabird colonies. Rough Legged Hawk, Snowy Owl, Short-eared Owl, Northern Gannet, Harlequinn Duck, Northern Harrier, Atlantic Puffin. Short cool summers, long cold winters, persistant snow cover. Treeless highland barren, spruce tuckamoor, Balsam Fir in deep sheltered valleys. 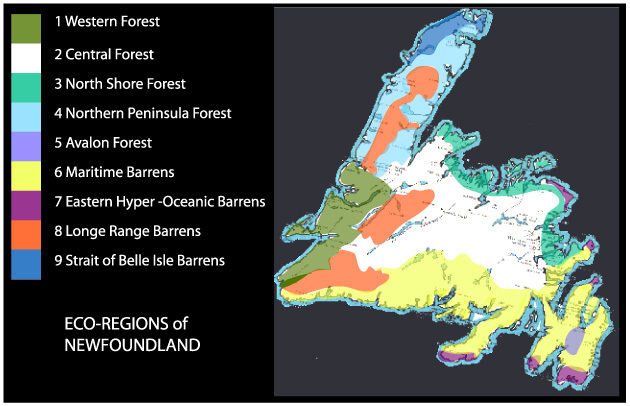 Summer range for Humber caribou herd, year round for Northern Peninsula herd. Arctic Hare, Rough Legged Hawk, Snowy Owl, Short-eared Owl, Northern Harrier. Flat & rocky along the western coast, hills to the east. Short cool summers, long cold winters, lowest island temperatures. Pack ice present until early summer, potential for frost year round. Treeless barrens, tuckamoor & tundra.